*For product only packages, product is shipped after payment is received. Please allow 5 – 10 business days to receive product. Cute, cuddly, and made by you! Choose from our menagerie of stuffed animals — bears, tigers, puppies, cats, horses, and many more. We also include "wishing stars" to stuff inside your animal, as well as a "birth certificate" to authenticate your "new arrival." We have 90 bear styles and 150 bear accessory options. The stuffed animals come in sets of 12, so in our standard package, you can choose up to 17 different styles to offer variety, if you like. Custom t-shirts and a huge array of clothing and accessories are also available at an additional charge. Fully staffed events are available at an additional charge. We can custom create a larger package OR a smaller package for your event. We have offerings to fit: Halloween, winter holidays, Christmas, graduation, football, basketball, baseball, cheerleading, St. Patrick's Day, Easter, Valentine's Day, Thanksgiving, and more. We offer our Bear Creations program as a product only package custom fit to any size. General: (2) 6’ tables, (2) chairs, (1) wastebasket, (1) assistant, (2) bottles of water. If nearby parking can be arranged that would be appreciated as well. Can we run the program ourselves? Bear Creations can be booked as a product only package or a fully staffed event. If you choose a product only package, you will receive instructions with your product that share our experiences with running this event and ideas on how to make it as successful as possible. Do we have to be able to sew? No. All of the stuffed animals have a hidden zipper in the back. As soon as you are done stuffing, you just zip it up. It is easy and fun to stuff your own bear. Yes. Let us know how many animals you would like (in increments of 12), and we will review discounted pricing with you. Do you offer orders smaller than 204 bears? Yes. We can put together an order with as few as 12 bears. Let us know how many you need and we will get a custom quote for you. Do you offer custom t-shirts? Yes. Pricing on these varies depending on what you want printed on the shirts. Send us a JPG of your design and we can review pricing with you. Are the stuffed animals of good quality? 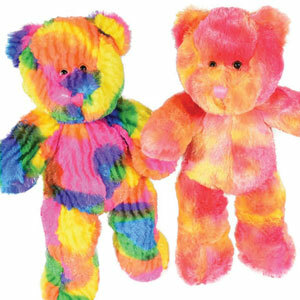 Our stuffed animals are similar to the quality you find at a greeting card store. These are NOT the kind of stuffed animals you find at a fair. Different styles have varying levels of softness based on the presentation of the animal, but they are all of very high quality. We would be happy to share with you our personal favorites and the items that other campuses have said were huge hits for them. Call or e-mail us for a price on a BASIC PACKAGE or let us know how many bears you need and we will create a quote for you based on your specific needs with our without staff to run the event. Can I see pictures of all of the options? We have a PDF catalogue of all of the stuffed animals available and another PDF catalogue with all of the accessory options. We can e-mail these to you so you can make your selections. The students really enjoyed this program. We had people lined up 30 minutes before we even got started. It was a HUGE hit! Want to talk with us about Bear Creations?